Millions of American adults are missing one or more teeth because of decay, gum disease and oral injury. After tooth extraction or loss, jaw bone and gums recede rapidly, and adjacent teeth weaken as they drift toward the empty tooth socket. For individuals missing all of their teeth, the toll on their self-image, nutrition and speech is devastating. So, Dr. David Tripulas, often advises placement of dental implants in Wharton. 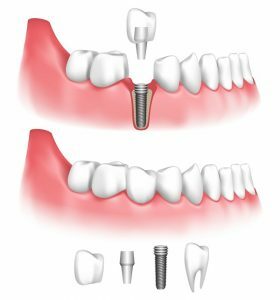 Secured in the jaw bone, dental implants provide amazingly natural-looking and stable tooth replacement. Tooth decay, dental abscess, gapped smiles–they happen sometimes, but expert restorative services from dentist in Wharton, Dr. David A. Tripulas, return smiles to great appearance and outstanding function. He has attained the highly skilled level of Master with the American Academy of General Dentistry and is also known for his friendly, compassionate manner. You can count on getting the finest care possible for your damaged smile.